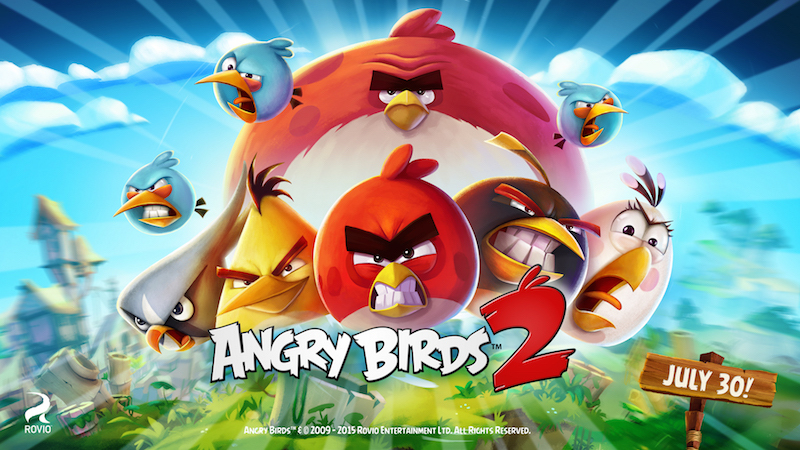 Finnish game developer Rovio today confirmed that its 2009 game Angry Birds is getting a direct sequel, Angry Birds 2, and fans will be able to play it starting July 30. The company released some promo artwork for the game that promises fans of the series a "bigger, badder, birdier" game than the original. Far from the second game in the series, counting spin-offs like Bad Piggies and Angry Birds Stella, there have been a total of fifteen games using the Angry Birds license in some way. Most were thematic spins on the original game's bird-launching mechanics like Angry Birds Star Wars, but over the years Rovio expanded by creating Angry Birds GO! and Angry Birds Epic, which introduced players to kart racing and turn-based strategy mechanics, respectively. Back in December 2009, when we were just a small games studio, we released our 52nd game featuring colorful birds, green pigs, a slingshot and a super catchy theme tune. Fast forward to 2015 and that game, Angry Birds, has taken the world by storm. The Angry Birds developer saw its first major profit decline in 2014, thanks to big new players in the mobile game landscape like Candy Crush, and a general sense of fatigue from gamers regarding the franchise. Nevertheless, Rovio is backing its flagship series more than ever with the announcement of a proper sequel and the planned release of an animated feature-length Angry Birds film next summer. The company promises that more details are to come on July 28, a few days before the game's official launch. Please do not speak on my behalf. That is the number 1 thing my girlfriend and I fight about (when she speaks on my behalf). I speak 5 fluent languages, I don't need people speaking on my behalf. I guess the one language you're not fluent in is sarcasm. I think I speak for everyone when I say this is the game we've been desperately waiting for. The original actually had a pretty good value and free updates. Yes, but the original game is from essentially an entirely different era in mobile gaming. I haven't played many of the spinoffs Rovio released, but if Angry Birds 2 follows the lead of many of the games on the "top grossing" list, it will be easy to pass on it. Sure, you can technically say IAPs aren't forced on anyone, and in some cases they're done tastefully. But in many cases, the game is entirely structured around forcing you to spend money to fully enjoy the game. That's tough to swallow for someone who grew up on games where you paid once and got the full experience. And I'm sure it will be overflowing with IAPs and other ways to keep you from enjoying the game unless you spend copious amounts of money. I'm just so jaded when it comes to mobile gaming. Really? Which languages do you speak? The language of pomposity, by the looks of it. This is either a hilarious misspeak or ultimate proof that Rovio has really milked the franchise wayyy too much. It's none of those. Angry Birds was their 52nd game, released in 2009. In other words, they made 51 games first (which were not Angry Birds), then they made another game, which was Angry Birds. And there's your "overnight" success.